The very first Cedar City Zombie Apocalypse 5K is a 3.1 mile run on the south end of Cedar City. This 5K run is designed for both the runner and non-runner. DISCLAIMER: THIS COURSE IS FILLED WITH ROCKY TERRAIN, STEEP SLOPES, SMALL CRAWLING SPACES, AND POTENTIALLY DISTURBING IMAGES. IF ANY OF THESE THINGS FRIGHTEN YOU, WE RECOMMEND YOU DO NOT PARTICIPATE. The Story: Cedar City has been overrun with zombies. However, there is hope. Two camps remain in seperate safe zones. However, when you get to one, you find out it has been overrun with zombies. It is now up to you to survive, you must run 3.1 miles from one camp to another without becoming zombie food. The Objective: Run, climb, crawl, sprint, and use your wits to get from one camp to another 3.1 miles away without losing all of your flags. If you do, you survived the zombie apocalypse…for now. If you don’t, you become a zombie yourself. But not to worry, both the survivor and the nonsurvivor will get a finishers prize. The Participant: There are two types of participants, the first is the runner. The second is a zombie. Zombies will provide their own clothing, however torn and trashed they may be (must be modest), we will provide the make-up. Professional and student make-up artists will “zombify” the zombie participants. Village: “Villages” consist of at least three no more than five runners. Each “village” will come up with a name, and develop a costume. The “village” with the best costume and team name, decided by appointed judges, will receive a prize (yet to be determined, but most likely a gift card). Check-In: Participant Check-in will take place at the Cedar City Aquatic Center (2090 W Royal Hunte Drive). Beginning at 7:30 AM. If you signed up to be a Zombie, you must show up at the Aquatic Center by 6 AM to receive your make-up. Make-up artists from Evans Hairstyling College are “zombifying” all the zombies. From there, you will then take your specified place on the course. TRANSFERS/DEFERMENTS: ABSOLUTELY NO TRANSFERS OR DEFERMENTS. NO EXCEPTIONS. If you have signed up to be a “Zombie”, you must arrive at the starting line at 6 AM for make-up. From there, you will be assigned to a specific location on the course. Please keep in mind that you are limited in your space of chasing down the “Survivor”. You can only chase the “survivor” for a length of about 25 yards. YOU ARE ONLY ALLOWED TO TAKE ONE FLAG PER RUNNER. Further, as a Zombie you are expected to be on the course for the entirety of the event. Under no circumstances should the “Survivor” and the “Zombie” participant be allowed to engage in physical contact with each other. 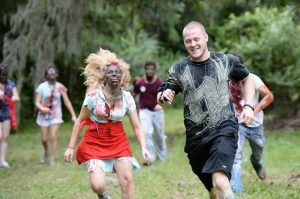 The only physcial contact that will be tolerated will be the “Zombie” participant reaching for the “Survivor’s” flag. If you are caught pushing, shoving, fighting, or any other physical altercation of any kind, both participants will be removed from the race immediatly and no refunds or transfers will be allowed. Place your flags in the manner of flag football (two on the side one in the back). Zombies will be trying to grab them and to minimize the chance that you don’t get touched in places you don’t want to follow this rule! If necessary, sacrifice your friends and family to save your life. You don’t need to outrun everyone, just the person behind you. Have fun! This race is not competetive at all, it is all in the name of having a good time. So make it one for yourself and everyone involved. The proposed course will start at Cedar Middle School and end there. Runners sprint from the Cedar Middle School field where they must endure a rocky, and fairly steep decent down to the trail. From there runners will run along the trail avoiding zombies. Eventually, they will make a left turn, cross the street onto a livestock trail. This trail at first is a steep climb, but evens out and begins to descend towards Home Depot. Runners must then cross another street make their way to the Sheep Tunnel. The Sheep Tunnel was built to accomodate livestock, but is now rarely used to since there are other alternative means to move livestock. Runners must enter the dark narrow sheep tunnel and try not to get their flags taken as they encounter zombie after zombie. If runners manage to survive, they come out the opposite end and finish at Cedar Middle School. For a reference of the map, view it here. Aid stations will be availabe throughout the course. Although, we encourage the participants to stay hydrated, we ask that participants do not linger at the aid stations for very long. While at the aid stations, Zombies are not allowed to grab any flags, but the longer the participant waits the more likely zombies are to notice and grab a flag as the participant leaves the aid station. In other words, DRINK AT YOUR OWN RISK. Spectators are encouraged to view the race. However, spectators are only allowed at the starting and finish line (Park Discovery 2077 W Royal Hunte Drive).